The Delta Force paintball centre in Wakefield, Leeds is ready for an action-packed weekend of paintball adventure after extensive refurbishment works were completed today. The most exciting addition to the centre is a brand new air system, with all CO2 guns now converted to run off air. This is fantastic news for paintball players throughout the Leeds, Manchester and Sheffield region as paintball guns running off air offer even better performance, firepower and accuracy. The Delta Force construction team have worked tirelessly over the last three weeks and have yet again outdone themselves with their standard of work. The base camp received a significant makeover with a brand new shop offering three service windows and a dedicated registration area, large de-kit area to make the end of day procedures run even smoother than before and a large toilet facility with hand washing facilities and eight flushing WC cubicles. These base camp additions yet again assert Delta Force’s position as the premier paintball provider in the UK, as most paintball operators offer nothing more than a festival-style portaloo and a few dirty benches. Other exciting additions at the centre include an enlarged car park and various game zone updates, including converting the Viet Cong Village scenario into the new POW Concentration Camp with two fortified guard towers. These changes are bound to get the adrenaline pumping over the weekend. 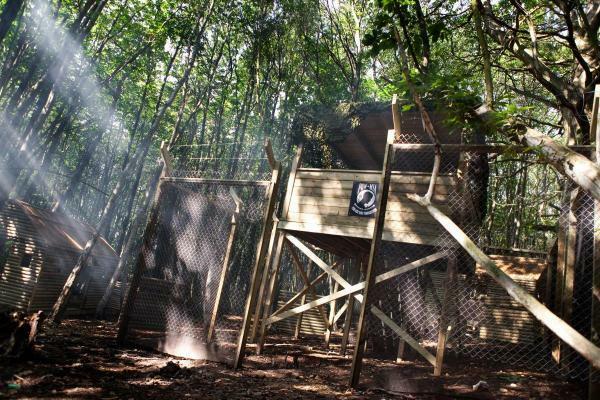 If you want to experience the ultimate paintball rush with Delta Force Paintball Leeds, call our booking office on 0203 869 9301and book your paintball experience with frends or family today!